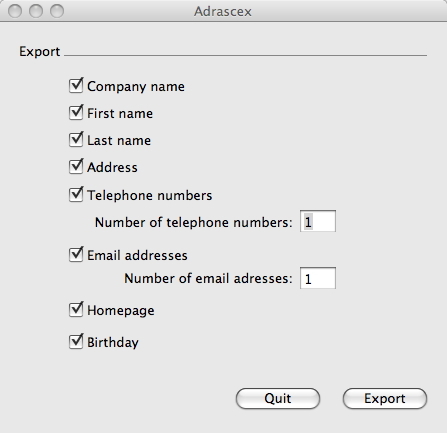 Adrascex stands for Address Book ASCII Export. The Address Book in Mac OS X can not export ASCII. But often requires pure ASCII, because other programs need it. Adrascex offers easy way to create ASCII-Files. Because Adrascex still not on a sufficient number of Systems tested, the program is a public-beta. Suggestions for improvements and expansion proposals and error messages are very welcome. Adrascex is freeware and will always remain freeware, if the beta status once deleted. The sharing or publish the software through other sources is quite welcome.